Image caption The Colombian military have been clearing land mines but many of them were laid by the Farc who have the records and maps of their locations. 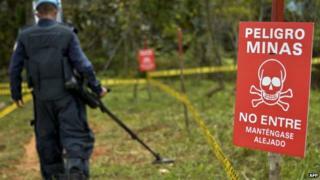 The Colombian army and Farc guerrillas have begun working together to clear landmines sown during 50 years of war, the government says. Officials said they had identified four areas for clearance in the northern region of Antioquia using maps provided by the Farc. Peace talks have been faltering since the left-wing rebel group suspended a unilateral ceasefire last week. Colombia is one of the most mine-ridden countries in the world. There have been almost 11,000 recorded deaths and injuries from landmines since 1990. The government's chief peace negotiator in Havana, Humberto de la Calle, said: "Farc handed over a map and actively contributed in the process." He said decommissioning anti-personnel mines "had become a reality". The mission, which took place over the course of a week, was the first step in a March agreement towards de-commissioning mines placed during the conflict. The work focused on a region severely affected by mines. Mr de la Calle said: "Work started in Antioquia, because it is the department historically with the most incidents of explosions from these objects." He said the area they had begun to search contained "more mines than inhabitants". The joint operation which had been agreed during the last round of peace talks taking place in Havana had been due to begin sooner, but the suspension of a unilateral ceasefire by Farc last week and the deaths of both army and Farc personnel in various attacks had delayed the start. Image caption Colombian soldiers have been practising with fake mines in preparation for demining in Cocorna municipality, in Antioquia. Image caption Soldiers need patience and to be highly organised. The Farc killed 11 soldiers in an ambush last month, causing President Juan Manuel Santos to order new air strikes on rebel positions. Around 40 rebel fighters have been killed since last week, including two high-ranking commanders. Mr de la Calle said that he hoped the joint de-mining operation would bring hope for the peace talks. "Who would have imagined an army sergeant and a Farc explosive expert spending days together exchanging opinions?" he asked.